The term ‘financial derivative’ implies futures, forward, options, swaps or any other hybrid asset, that has no independent value, i.e. its value is based on the underlying securities, commodities, currency etc. In this context, futures and options are often misconstrued, by many people. Futures may be understood as the legally binding contract to trade the underlying financial asset of standardized quality and quantity, at an agreed price, at a future specified date. Conversely, options contract is described as a choice in the hands of the investor, i.e. the right to execute the contract of buying or selling a particular financial product at a pre-specified price, before the expiry of the stipulated time. Take a glance at the article provided to your, to have a clear understanding of the difference between futures and options. Meaning Futures contract is a binding agreement, for buying and selling of a financial instrument at a predetermined price at a future specified date. Options are the contract in which the investor gets the right to buy or sell the financial instrument at a set price, on or before a certain date, however the investor is not obligated to do so. Obligation of buyer Yes, to execute the contract. No, there is no obligation. Execution of contract On the agreed date. Anytime before the expiry of the agreed date. Advance payment No advance payment Paid in the form of premiums. Degree of profit/loss Unlimited Unlimited profit and limited loss. Future is defined as a contract, between two parties, buyer and seller where both the parties promise to each other of buying or selling of the financial asset at an agreed date in the future and at a set price. As the contract is legally binding, the parties to it must perform it by transferring stock/cash respectively. The futures contract is a standardized and transferable contract that revolves around, its four key elements, i.e. transaction date, price, buyer, and seller. The items which are traded on the stock exchange like NYSE or NASDAQ, BSE or NSE in a future contract include currencies, commodities, stocks and other similar financial assets. In such contracts the buyer expects the asset price to rise while the seller expects it to fall. An exchange traded derivative where the holder of the financial asset has the right to buy or sell securities at a certain price, on or before a stipulated date is regarded as an option. The predetermined price on which the trading is concluded is known as the strike price. The option can be purchased by paying an upfront cost, which is non-refundable in nature, known as premium. The option to buy the underlying asset is call option while the option to sell the asset is put option. In both the cases, the right of exercising the option lies with the buyer only, but he is not obligated to do so. A binding agreement, for buying and selling of a financial instrument at a predetermined price at a future specified date, is known as Futures Contract. The contract in which the investor gets the right to buy or sell the financial instrument at a set price, on or before a certain date, however, the investor is not obligated to do so, is known as Options Contract. Futures contract puts an obligation on the buyer to honour the contract on the stated date, so he is locked into the contract. Conversely, in the options contract, there is an option, not the obligation of buying or selling the security. In futures, the performance of the contract is done only at the future specified date, but in the case of options, the performance of the contract can be done at any time before the expiry of the agreed date. Futures are riskier than the options. Apart from the commission paid, futures do not require advance payment, but options require the payment of premium. In futures, a person can earn/incur an unlimited amount of profit or loss, whereas in options the profits are unlimited, but the losses are up to a certain level. Futures and Options both are exchange traded derivative contracts that are traded on stock exchanges like Bombay Stock Exchange (BSE) or National Stock Exchange (NSE) which are subject to daily settlement. The underlying asset covered by these contracts is the financial products such as commodities, currencies, bonds, stocks and so on. Moreover, both the contracts require a margin account. So, after the detailed discussion on the two investment topics, it can be said that there is nothing to be confused between the two. 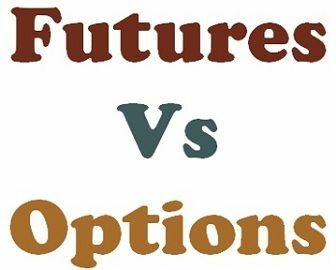 As the name suggests options come with an option (choice) while futures does not have any options but their performance and execution are certain. Really helped me to understand the futures and options. Very much helpful for clarifying basic understanding of Options and Futures.